The possibilities for digital design are endless, and multiplying daily. With changing technology that creates new possibilities and new frameworks to create within, designers and developers have the benefit - and the challenge - of constant reinvention. We sat down with three digital talents to find out: with infinite possibilities to explore, where do you begin? The Herengracht outside was just about freezing, and the streets were nearly empty, on what was the coldest night of the year. 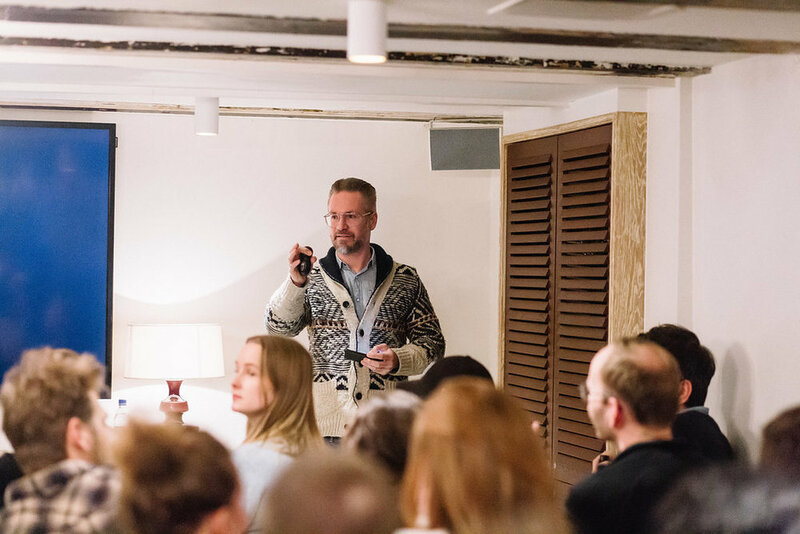 But it was warm inside The Hoxton Amsterdam’s apartment, where the sound of opening bottles of Oedipus beer was punctuated by the clink of “prost!” as members and friends of Workwhile gathered for the fourth Workwhile Design Talk: Designing for Digital. The evening was hosted by us at Workwhile, and co-sponsored by our good friends at Tthe Hoxton. This fourth monthly edition sold out in record time - under two weeks - and despite the below-freezing temperatures, the house was packed. The aim of the Design Talks is to bring together creatives in design, digital, and development to learn from independently-working experts on topics related to design. Each talk not only inspires, but achieves two other objectives: first, that participants learn something they can apply to their own work, and second, that participants create worthwhile connections to help their careers to grow. To kick off our 2018 program, we selected the topic of digital inspiration, specifically, where to find it and how to harness it. Leading the conversation was Bert Hagendoorn, our moderator and founder of Dutch Digital Design; Keith Kornson, Creative Partner and Founder of RONIN Amsterdam; and Tijmen Mulder, Founder of Robot Kittens. The all-male digital line-up got a tongue-in-cheek nod from our beer sponsor, Oedipus Brewing, who supplied two beers: Offline and Mannenliefde. Attendees asked us: Why were there no women on the panel? We at Workwhile were determined find independently-working (freelance) women in digital to round out the panel, but both we and our wider network found the brief impossible, leading us to ask ourselves: Where are the independently-working, female digital designers and developers in the Netherlands? Please introduce us; we’re keen to meet them. Moderator Bert Hagendoorn from Dutch Digital Design kicked off the night by throwing a question to the audience: when faced with a new project, where do you begin? Bert began by explaining what sets Dutch design design apart, citing the mentality behind the work. “We focus not only on what something looks like, but also on how it works, and what the effect is,” he said. “We like to explore boundaries and dare to experiment.” He presented three campaigns that demonstrated this uniquely Dutch approach - and global reach - ranging from the world's largest VR installation at a Singapore museum to an AR app transforming the Dubai real estate market. Rather than adhering to the old rule that the secret of creativity is about hiding your sources, Keith pulled back the curtain on his inspiration. He shared some of his favorite sources, ranging from standards Dribbble and Behance to lesser-known Art of the Title and Muzli. But he admitted his richest inspiration - and great love - comes from gaming. He took us behind the scenes of some of his projects - particularly KLM Space Launch, adidas Brazuca, and premiering a totally new project from RONIN - to call out the games that inspired him, how this inspiration comes through in his design. He concluded with a challenge from Bloodbourne, one of the most difficult games in the market where players go through a series of challenges that more often than not end in death… until the player figures out the right solution and lives into the next round. The game’s motto quickly became the mantra of the night. Tijmen answered that challenge by taking us back - way back - to show how the need to find communication solutions led to the development of digital. Breezing through millennia of history from Egyptian hieroglyphics to the chaos of 1990s internet design (“In 1995, we got Flash, and that’s when things got fucked up!”) to jaw-dropping technology of today, Tijmen showed us some “cool technology” that inspires him and his team at Robot Kittens to meet the challenges posed by the pace of constant technological change. Tijmen focused on technology raising the stakes for designers today, focusing on AR, VR, neural networks, and machine learning. Citing examples like Adobe’s new figure isolation tool (that takes much of the design skill out of designing) and FakeApp (an app that can seamlessly replace faces on videos), he showed that not only are possibilities endless for designers and developers, but that these technologies also pose challenges to the craft. Ending on an inspirational note, Tijmen urged creative minds to continue exploring the potential of technology. Big thanks to our sponsors: The Hoxton, Oedipus Brewery, Mastino Pizza, and Snap Me Pretty Photography for supporting this fourth edition of the Workwhile Design Talks. Our fifth edition, “Get Bad to Get Good”, takes place at The Hoxton Amsterdam on Wednesday 28th March. We’re lifting the curtain on designers’ biggest mistakes and how it made them great. Free tickets are available online via Tthe Hoxton. But hurry, we’re nearly sold out!